Ingles & Hayday held their most successful auction to date, in March. It was also the most successful London auction since 2011. Selling a remarkable 92% of their lots by value, many of their fine italian instruments achieved prices at or above their high estimates. The total value of lots sold was £4,600,000. The auction highlight was undoubtedly the celebrated ‘Ex-Croall; McEwen’ violin made in 1684 by the Cremonese master, Antonio Stradivari. With a fascinating Scottish provenance and illustrious recording history, the former concert instrument of Frank Peter Zimmermann sold for £1,920,000 to a Canadian philanthropist who will be loaning the violin to a musician. There were other high achievers. A beautiful circa 1790 Lorenzo Storioni violin made over double its high estimate, achieving £432,000; a Tommaso Balestrieri violin dated 1792 fetched £204,000; and a circa 1670 Francesco Rugeri violin made double its high estimate, selling for £120,000. A lovely example of Tomaso Eberle’s work from the 1770’s sold for £36,000, proving the enduring popularity of this Neopolitan maker’s instruments. Among the non-Italians, highlights included a J.T. Cuypers violin (made in the Hague, circa 1780) which sold for £38,000, and a late Vincenzo Panormo, dating from around 1810 and showing signs of his son Joseph’s work, made well over its high estimate, fetching £45,600. In the bow section, the auction achieved the rare distinction of featuring six Eugène Sartory bows all selling at or above their high estimates. The highlight was surely a silver-mounted Dominiqe Peccatte violin bow made in Mirecourt circa 1845, which sold for £69,000. Heated bidding on a viola by Carlo Tononi with a 40.5cm-long back reached £108,000 – smashing the circa 1705 instrument’s upper estimate of £60,000. And among the cellos, two standouts included £84,000 achieved for a Celeste Farotti made in Milan circa 1915, and a fine William Forster II cello made in England in 1801 which was sold for £78,000. 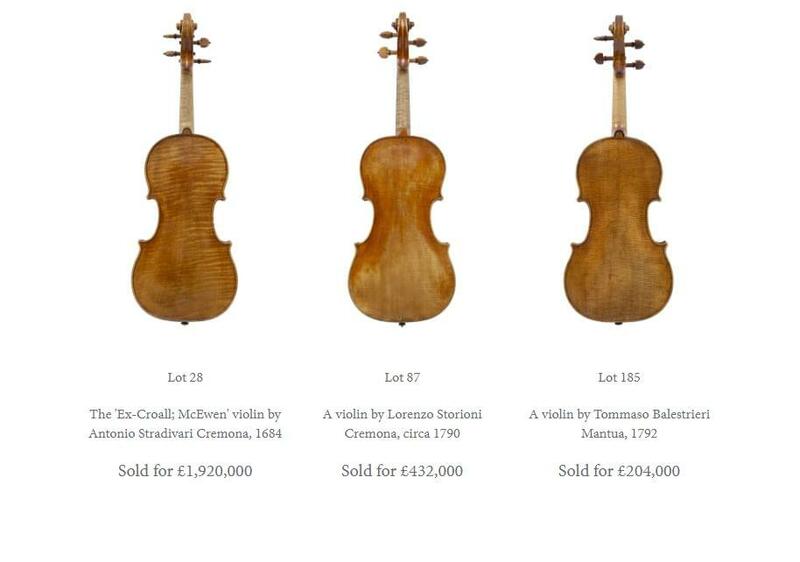 The auction, which was held at Sotheby’s in London, proved ongoing confidence in the market for fine stringed instruments and bows.